Zappos: A Workplace Where No One And Everyone Is The Boss Earlier this year, the online retailer eliminated managers and embraced "holacracy" — a system of self-governance. It's one of a handful of firms that's trying to make middle management obsolete. 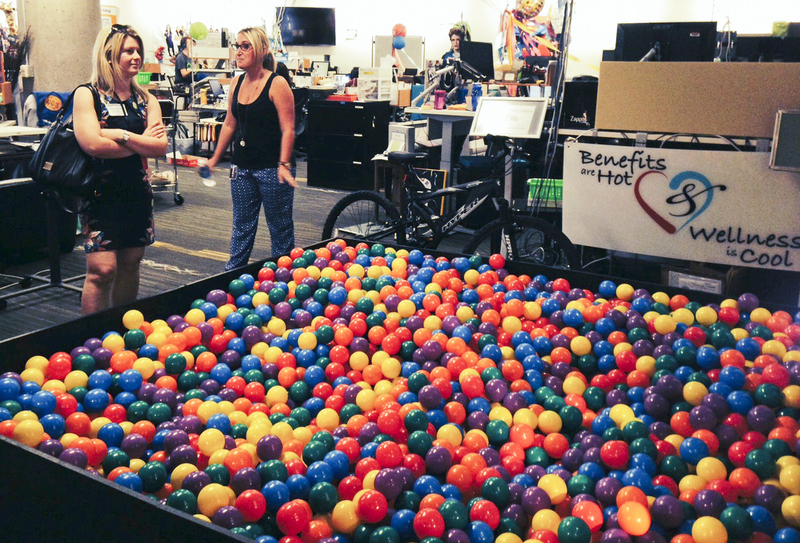 Zappos.com tour guide Erika Newman (right) shows off the ball pit in the human resources department of the company's Las Vegas headquarters. Zappos eliminated managers and embraced a system of self-governance known as holacracy. Jacqui Gonzalez once spent an hour and a half on the phone helping a customer. The Zappos.com employee enjoys being generous with the online shoe retailer's money, sending gift baskets and thank-you cards to people whose complaints she has solved. And mostly, she's grateful that she doesn't have a manager to consult in making those decisions. "We don't have to put someone on hold and ask permission," says the former customer service agent, who is now a tour guide at the company. "We don't have a manager that you need to be transferred to. How refreshing is that?" Such is life at Zappos, which has adopted a system of self-governance that effectively has eliminated all management. This spring, CEO Tony Hsieh — an entrepreneur known for his opinions on management — sent an all-staff email explaining how the entire company was embracing a concept known as "holacracy." Holacracy is based on a term and concept coined by anti-totalitarian political writer Arthur Koestler. Its central tenets include individual autonomy and self-governance. In a holacracy, employees aren't told how to work. Instead, they belong to voluntary groups called "circles," or peers who help vet new ideas or problems. Everyone has equal say, and employees are evaluated and rewarded by peers, instead of by a boss. At Zappos, those who didn't wish to participate could take a buyout; 14 percent of the company's 1,600 employees took the offer. 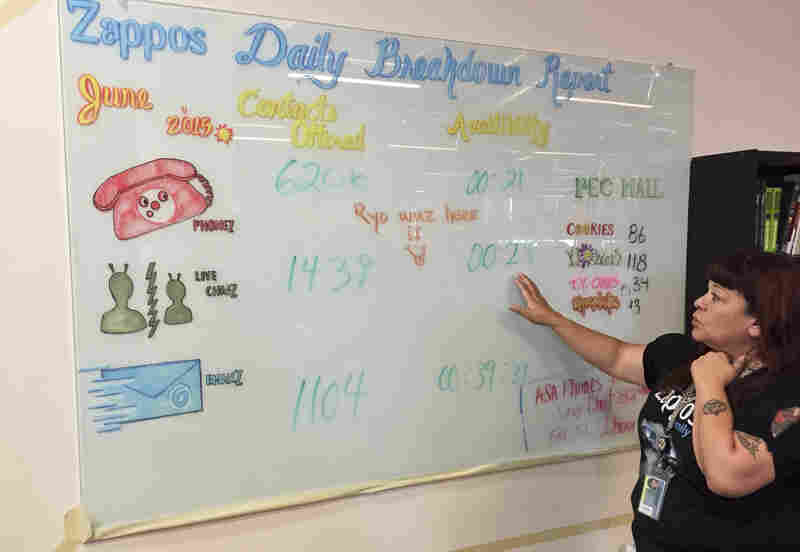 Zappos tour guide and former customer service agent Jacqui Gonzalez explains how Zappos tracks response times to incoming customer calls, chats and emails. She also explains the importance of cultivating "PEC," personal emotional connections, with customers and sending some of them gifts of cookies and flowers. Holacracy's complicated lingo and structure can be hard to get used to. But those who remain at Zappos say that so far, the system has empowered more people to take charge of their work goals and problems. Zappos, which is owned by Amazon, started shifting its system two years ago. It's too early to measure the impact, but employees say the goal is to maintain a small-firm culture even as it grows. Before she became a Zappos customer service representative, Shaea Labus managed a Lucky Brand Jeans store. "I'd tell [staff] where to be and what their sales goals were," she says. If there were problems, it was Labus' job to identify and solve them. At Zappos, it's her job to identify problems and goals in her job — then bring them to her circle to address. Really what we're trying to do is turn each employee into a mini entrepreneur who has the ability to sense ideas and do something about it. "Instead of analyzing it from the top down, we just start where the work is," Labus says. "Is this feasible for them to do this?" Holacracy may sound like a recipe for chaos. But in fact, meetings are highly structured. Anyone can add items to the agenda, which is documented using online software so everyone can monitor every decision. There are meeting leaders, known as "lead links," but their role is essentially limited to directing meetings according to a set of rules. They also help the circle keep track of its time and money resources. To the uninitiated, the lingo and format of a holacratic meeting can be bewildering. One recent meeting involved the 10 members of Zappos' arts and entertainment circle, whose mission is "to design, support and provide opportunities for employees to express their creative and artistic endeavors" — a high priority for a company that prides itself on its esprit de corps. Participants call out agenda items — known as "tensions" in holacratic parlance — in the form of problems, projects or new ideas, which get added to a list that's projected onto a big screen. A Halloween parade, a parody dance video in the making and where to place a human-sized hamster wheel on campus all make it on the list. After a few minutes of discussion about each item, the action is tagged in online software with instructions for follow-up. Holacratic governance is the brainchild of Brian Robertson, a serial entrepreneur who sought better ways of running his companies. He likens the system to cell biology. "You don't have a boss cell telling the other cells what to do. Every cell has its own self-organizing process," Robertson says. "And yet, they're kind of grouped together into an organ that integrates them and itself acts as a whole entity." Robertson says about 300 organizations — including Washington state government and companies both large and small — are using or piloting holacracy. He says it makes organizations nimble and adaptable. But, he admits, it can be a difficult adjustment, especially for organizations accustomed to a top-down hierarchy. "There's something almost safe and comforting, even when we don't like it, about being in a system where there's somebody else whose job it is to protect us, take care of us, nurture us," Robertson says. "And when they don't do that well, we get to be angry with them and blame them and hide behind them." John Bunch oversees the implementation of holacracy at Zappos. Early on, he says, he struggled to get rid of his own managerial impulses. "I found myself at times wanting to command and control things to be a specific way," he says. "But I realized that's not what we're doing here." Bunch says although holacracy stresses individual autonomy, it's actually the group's interests that advance. "Really what we're trying to do is turn each employee into a mini entrepreneur who has the ability to sense ideas and do something about it," he says.